Gawain of Orkney has not been to Camelot since before his father led a rebellion against King Arthur. Now that the war is over Gawain is sent to attend Arthur's wedding as a token of peace. 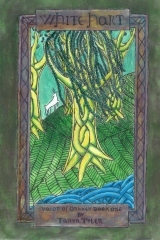 The night of the wedding Arthur bids Gawain to hunt a white hart -- a beautiful deer of unearthly purity. Gawain accepts the quest but the dangers of the wilderness become hard to battle when he is bound by Arthur's new ideals of peace and trust. Gawain realizes he may not be so different from the knights of the old, violent ways of as he had imagined.